Auxiliary Equipment - Gillespie & Powers, Inc.
Gillespie & Powers patented Autotapper design helps eliminate the need for personal interface with the transferring process addressing the main concerns of every cast house, SAFETY! The Autotapper allows operators to be a safe distance away from the tap plugs and trough during the transfer process. The Vortex Submerging Device is a trolley-supported vortexer and rapid submerging system. 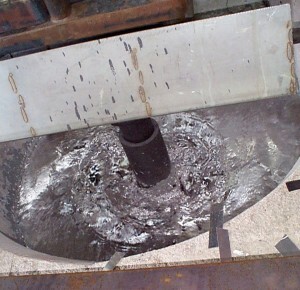 The Vortex overcomes the high surface tension of molten aluminum, separates dross simultaneously and achieves full utilization of the furnace’s thermal capacity. Drier dross and a separate well make removal easier. Continuous charging is possible with no interruption in production. Used in combination with the GPX Automatic Salt charging System, melt loss is reduced further and dross separation substantially improves. No manual labor is required for melting when all elements of the total GPX system are installed: the Trolley-Supported Vortexer, the Vibratory Conveyor Feed Bin and the Automatic Salt Charger. All equipment has been fully tested and is being used to improve production in custom designed installations around the country. Increased control of the entire production process means increased efficiency, increased recovery, reduced costs, greater productivity. The continuous feed Vibratory Scrap Feeder is a piece of auxiliary equipment to supplement the operation of side well melters; to provide for continuous addition of scrap charge material. This provides for totally unassisted feeding of scrap material, and usually operates in conjunction with other auxiliary equipment including the GPX vortex submerging device and the automatic salt flux addition system. 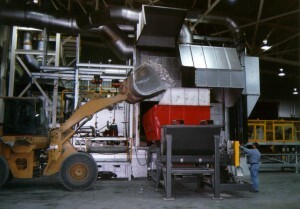 The Vibratory Scrap Feeder is designed to be an integral part of the Gillespie & Powers, Inc. total plant material handling and melting operations. From shredding, to metal out the door, Gillespie & Powers, Inc. offers all aspects for the efficient aluminum melting process. 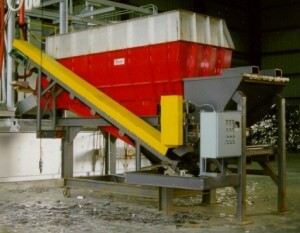 Variations in head load and material damping cause fluctuations in the capacity and feed rate of scrap feeders that are not sub-resonant tuned. 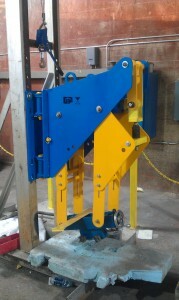 Scrap feeders have negligible change in trough stroke when subjected to varying head load and material damping. Our precision sub-resonant tuned Scrap Feeders maintain stroke consistency and speed stability thus delivering higher capacities at controlled feed rates, and repeatability. Gillespie & Powers LEAK DETECTION SYSTEM is designed to detect the presence of molten Metal at specified trough elevations in the event of a tap hole leak. 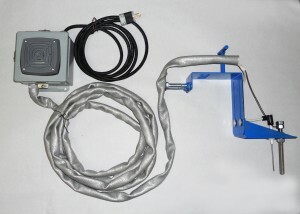 This product is equipped with a high pitch alarm that notifies the operators of the condition, which it turn reduces the probability of injury in the event of a metal leak.